Tiberius Gemellus was the son of twins born to Drusus and Livilla in 19 AD. Thus, Gemellus was the grandson of Emperor Tiberius and potential heir to the throne. 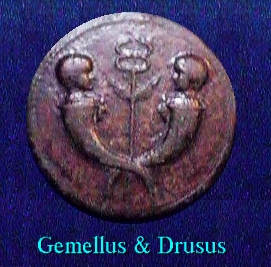 His brother died as a child so Gemellus was raised along with his older sister, Julia. As a child, however, Gemellus was never loved nor liked much by his grandfather, who could not forgive his mother for the murdere of her husband, Tiberius’ son Drusus. Tiberius considered Gemellus to be most likely the son of Livilla’s adultery with Sejanus or someone else. It is unlikely that Gemellus was the son of Sejanus since by most accounts her affair with the ambitious Prefect of the Praetorian Guard did not begin until around 23 AD. After 33 AD, all hope for reconcilliation with his grandfather was lost when Gaius Caligula became Tiberius’ favorite and heir to the throne. Still, Tiberius named both Gaius Caligula and Tiberius Gemellus as heirs to the throne in his will. Caligula, aided by the Prefect of the Praetorian Guard, Macro, succeeded in having the will rescinded, which allowed Caligula to assume the throne exclusively. Gemellus was still quite young and certainly had no political power or supporters to speak of in the Senate or at court. He was given the title toga virilis as well as the title PRINCEPS IUVENTUTIS, thus marking him as the heir to Caligula. The mental state of Caligula worsened and in his lust for blood, Gemellus was finally murdered in 37 AD. Caligula claimed that Gemellus was taking a preventative dose of poison, so had the Tribune of the Guard decapitated him, allegedly before he could poison the Caligula. The medicine that Gemellus had been taking was a remedy for a nervous cough.